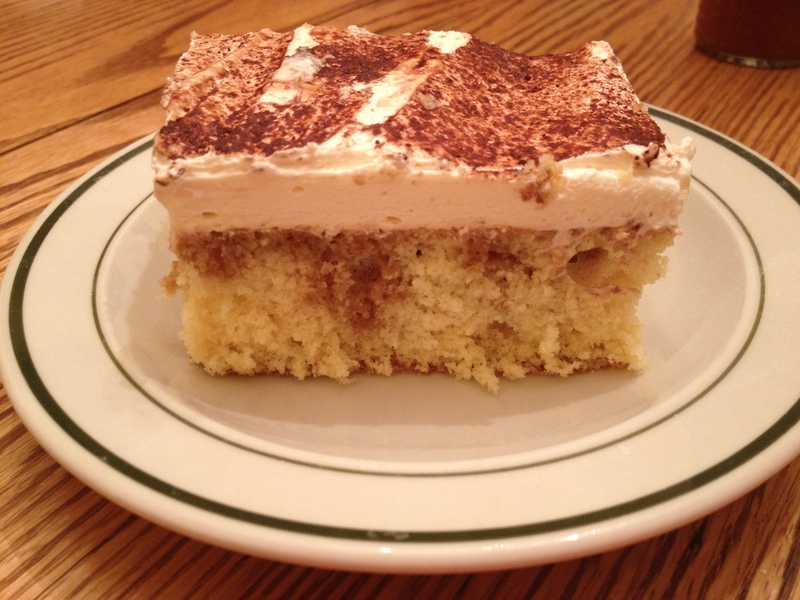 So, like so many other days of my life, I found myself in a hotel conference room having a staring contest with a piece of tiramisu last week. It’s one of my favorite desserts… a real treat… but I felt guilty not knowing how bad it was for me…so I walked away eating only half, and already formulating this recipe in my head. I came home and gave it a “test drive” just 2 nights later and I have to say I was VERY happy with the results. 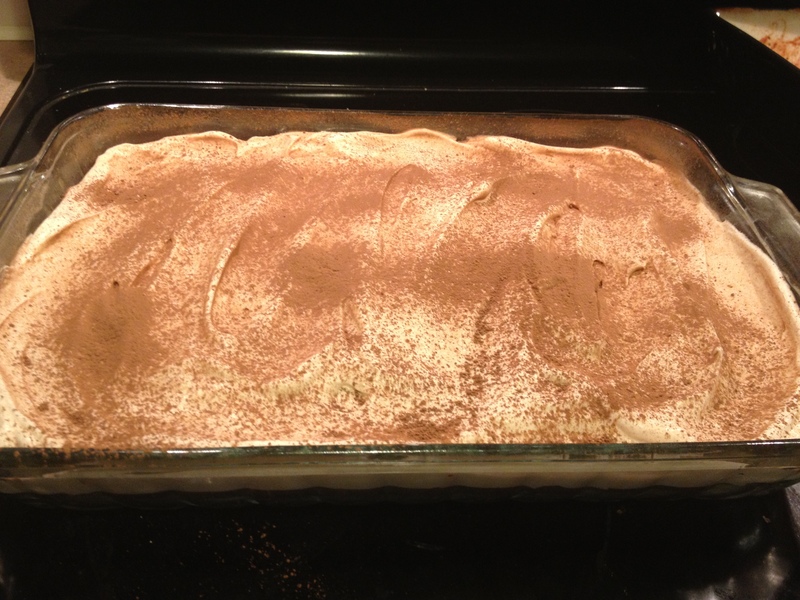 This is similar to standard tiramisu in that it’s delicious… it’s different than standard tiramisu in 2 significant ways. 1. It’s EASY to make… and 2. It’s LOW in calories! As I’m sure you’ll notice, this is based on a “poke cake” recipe I’ve used before… but it just seemed like the easiest way to get coffee Into your cake without having an overwhelming coffee flavor. yum. 1. Mix cake mix, egg whites and soda together and pour into a 9×13 pan which has been sprayed with nonstick spray. 2. Bake cake according to directions on package. 3. Once the cake is finished, allow it to cool about 5 minutes. 4. Mix hot coffee with gelatin, and mix until fully dissolved. 5. Use a 2 prong fork to poke holes throughout the cake, about 1 inch apart…which should leave you with a small hole appx every 1 inch. Poke hard enough to touch the bottom of the pan with the fork. 6. Pour coffee mixture evenly over the entire cake. 7. Refrigerate for about 2-3 hours (or overnight) before moving on to frosting. 8. When the cake has set, it’s ready to frost. 9. Place milk into a bowl, and whisk in pudding mix until it begins to thicken. 10. Once pudding has begun to thicken, gently fold in cool whip until blended, but don’t overdo it. 11. Spread mixture over cake. Sift Cocoa powder over top of cake. Cover and refrigerate at least a few hours before serving. 16 Servings= 152 Calories Per Serving! I found a different variation of this on http://www.skinnytaste.com, however I made a few adjustments, and this was REALLY good. 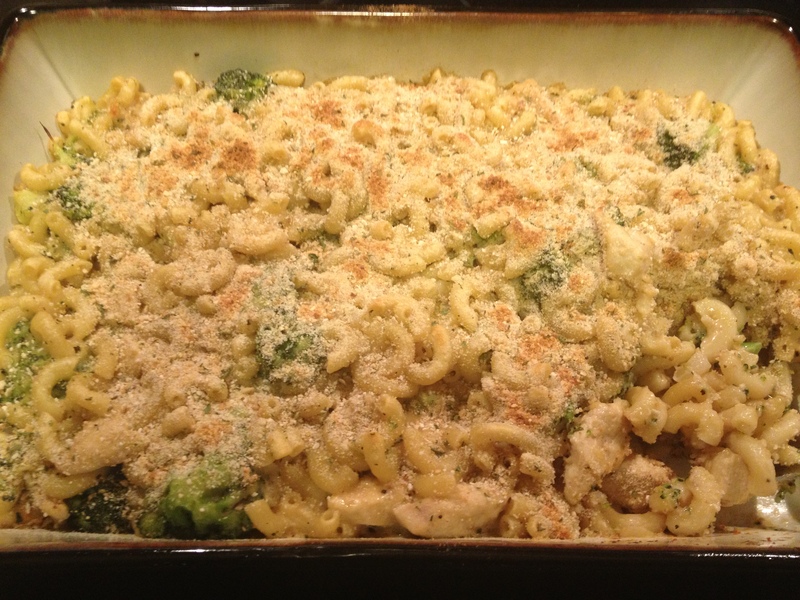 I’m not usually a big “casserole” fan, but I will definitely be making this again- often. My kids LOVED it. I’m thinking about trying it with a couple cans of Tuna next time for a tuna casserole. 1. Dice Chicken, and sauté in a skillet, or boil it, or bake it… just make sure it’s seasoned with salt and pepper, however you choose to cook it. 2. Meanwhile, start boiling the water for your noodles and broccoli. Be sure to add salt to the water for flavor. Cook the noodles and broccoli together In the pot until noodles are al dente and then drain them well. 3. Melt Butter in a heavy skillet. Cook onions in butter for 2-3 minutes, until translucent. Add flour, and mix well. This won’t be enough fat to create a true “roux” so once you get the flour mixed in well, you’ll need to be ready to add the chicken broth pretty soon. 4. When flour is all mixed in, begin slowly adding chicken broth, stirring until smooth along the way. I added in about 1/2 cup increments (about 4 equal portions, stirring until smooth in between each one). 5. Once Chicken broth is all incorporated, it should begin to thicken. Once all lumps are gone, add milk and continue to stir. Once the sauce has thickened, stir in parmesan cheese, then cheddar. Stir until smooth. 6. 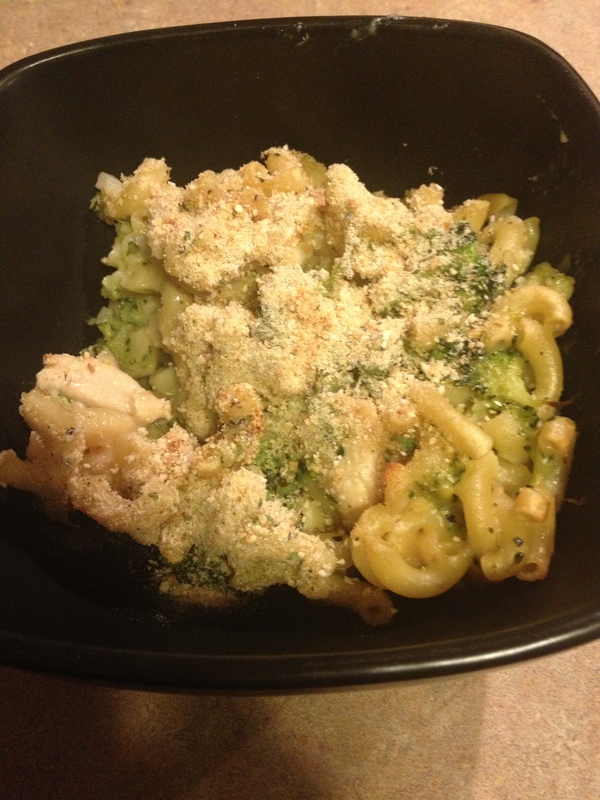 Mix Chicken, pasta and broccoli, and sauce all together. Once blended, pour into a greased 9×13 pan. Sprinkle bread crumbs evenly across top and cover with foil. Bake 20 min at 375. 7. Remove foil, and continue cooking 10 min. If crumbs do not brown, feel free to broil for a couple of minutes, until golden brown. Note: On the flour, I used a seasoned flour rom the old mill in Gatlinburg. It has some unnamed spices in it to add flavor, and I think this really makes a difference. If I used plain flour, i’d probably add salt, pepper, and a little garlic powder. I found this recipe on www.skinnytaste.com and it’s so good. I was looking for something fun to do with the kids, and here you have it. 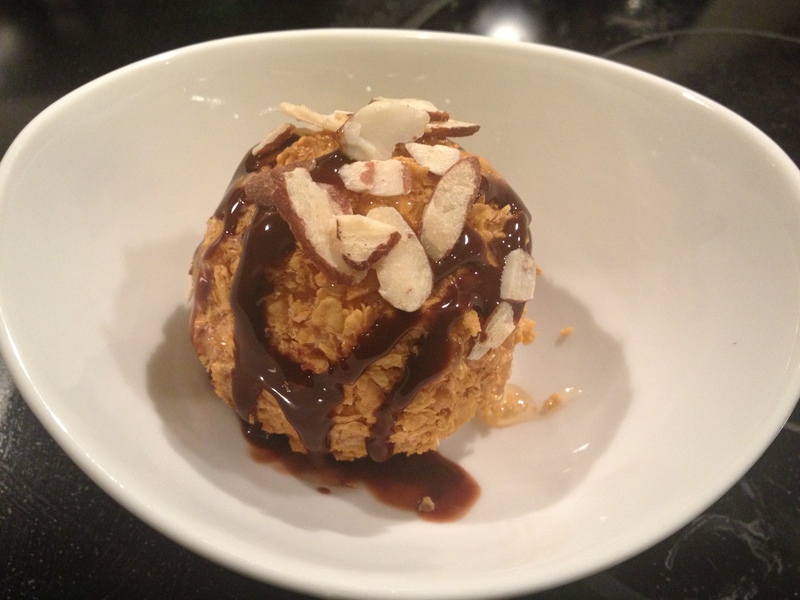 It was good enough that I bought more ice cream to make this again in the future. 1. Scoop out 6 1/2 cup portions of vanilla ice cream. Round them into balls, and place on a baking sheet lined with wax or parchment paper. Place these in the freezer for 2 hours or until they are very hard. 2. Place cinnamon and cereal in the food processer and blend until well crushed. Place in a freezer size baggie. 3. Roll each individual scoop of ice cream in cereal mixture until completely coated. 4. Drizzle each scoop with 1 tsp of honey, and 1 tbsp. of hersey’s lite syrup.